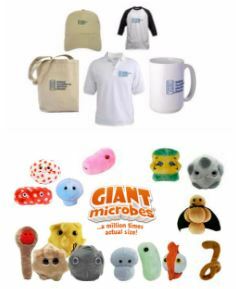 As spring arrives along with unpredictable weather, 2018 is off to a very busy start for education and outreach activities at the National Foundation for Infectious Diseases (NFID). In February, President-Elect Joseph A. Bocchini, Jr., MD and Senior Director, Education & Outreach, Joanna Colbourne, CAE, joined me in representing NFID at the 2018 National HPV Roundtable to discuss strategies for protecting teens against HPV-related cancers. 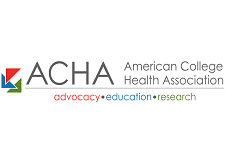 In the US, HPV vaccination rates remain below public health goals; however, Australia is now on track to become the first country to eradicate cervical cancer based on the successful HPV vaccine program in place. Although progress has been made in the US, we still have a lot of work to do ensure that teens are both protected against vaccine-preventable diseases, and empowered to continue health-focused conversations throughout their lives, ultimately taking charge and responsibility of their own health. 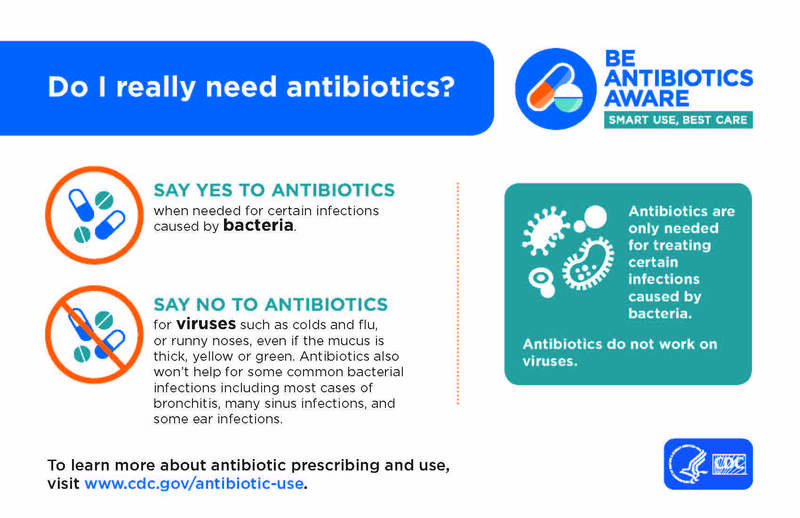 To further the theme of teen empowerment and the importance of protecting teens against vaccine-preventable diseases, including HPV as well as whooping cough, meningococcal disease, and flu, NFID participated in 2018 Teen Health Week. Activities included a new social media campaign modeled after the 'truth' anti-smoking campaign, a webinar on HPV Vaccination: Recommendations and Strategies for Improving Coverage, and an NFID News blog post I wrote about my teenage twin daughters, Empowering Teens as Health Advocates. 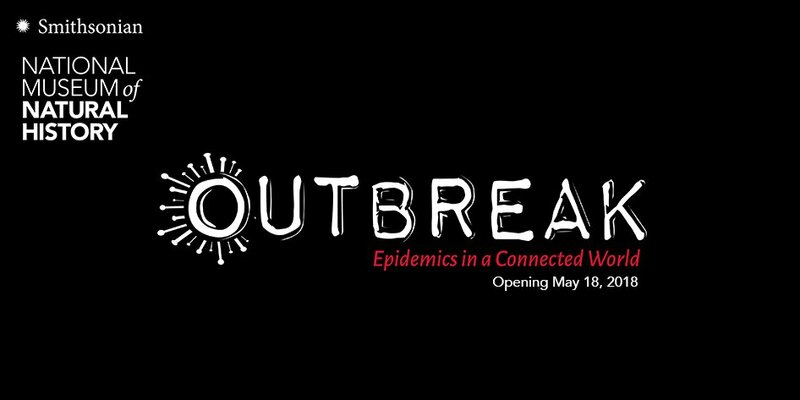 As a proud sponsor, NFID is also busy preparing for the upcoming Smithsonian exhibit, Outbreak: Epidemics in a Connected World, which opens on May 18, 2018 at the National Museum of Natural History in Washington, DC. In recognition of the 100th anniversary of the 1918 influenza pandemic that killed an estimated 50 million individuals worldwide, the exhibit will examine the intricate network between humans, animals, their environments, and microbes—why infectious diseases emerge where they do, how they spill over from animals to people, why they spread so quickly, and where to look for the next one. The 3-year exhibit will also address public fears and media hype head-on, empowering visitors to respond to future epidemics with knowledge. 2018 also marks the 45th anniversary of NFID and the 2018 Annual Awards Dinner on May 10, 2018 will include a special celebration to acknowledge this important milestone. 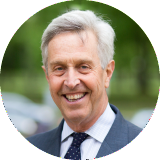 I do hope that you will join us as we honor Roger I. Glass, MD, PhD, Kathryn M. Edwards, MD, and Anne Schuchat, MD (RADM, USPHS) for their significant and lasting public health contributions. 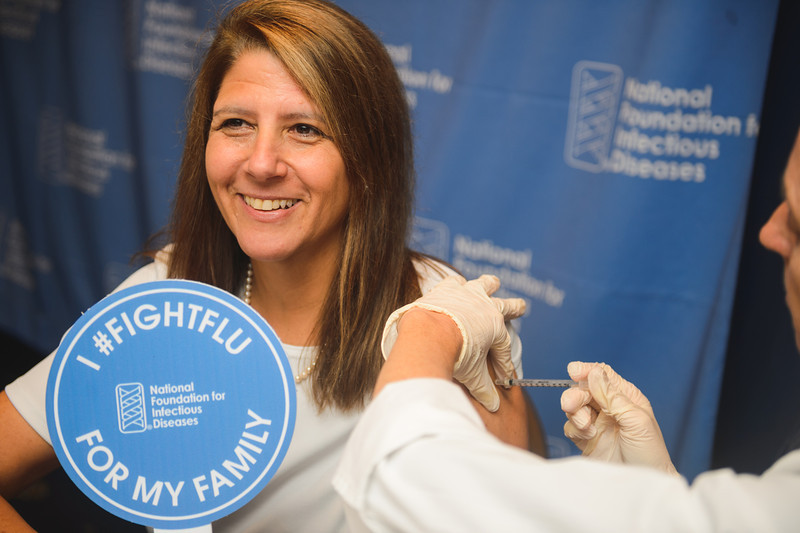 For the past 45 years, NFID has been an innovative thought leader tackling the challenges and minimizing the impact of infectious diseases on US public health. 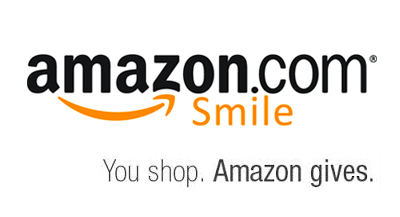 We appreciate your support and hope that you will consider making an online donation to help us commemorate our 45th anniversary. 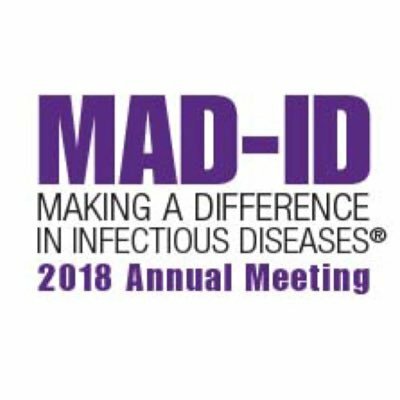 Join NFID in Bethesda, MD on April 23-25, 2018 for this exciting program including cutting-edge presentations and opportunities to network with vaccinology professionals from around the world, while earning up to 15.5 AMA PRA Category 1 Credits™. 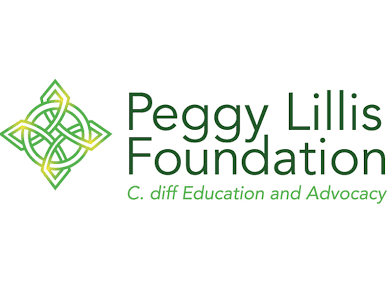 The program also includes a new workshop, Building Careers in Vaccinology, which will provide early-career researchers a unique opportunity to interact with vaccinology leaders in an intimate, small group setting. Seats are limited and included with the full conference registration. Admission will be available on a first come, first served basis. Download the conference brochure for additional details and an overview of the program highlights. 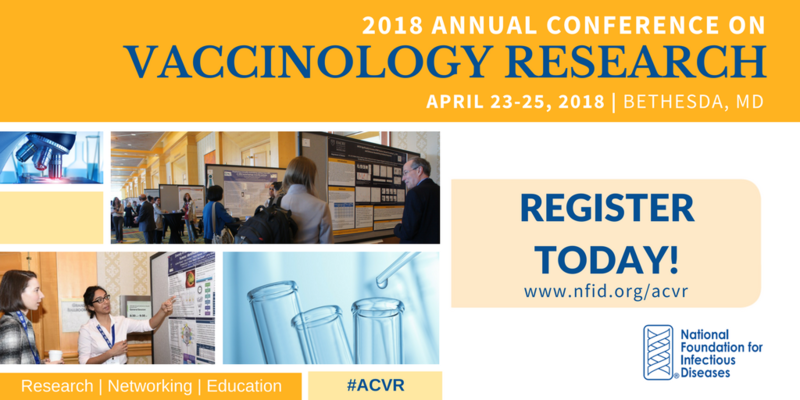 Registered for ACVR or local to the Bethesda area? 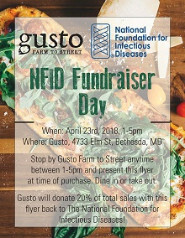 Plan to stop by Gusto Farm to Street on Monday, April 23, 2018 between 1:00-5:00 PM to participate in a special NFID fundraiser. Present this flyer and Gusto will donate 20% of all purchases to NFID to support our mission. Join the National Foundation for Infectious Diseases (NFID) on Thursday, May 10, 2018 at the historic Willard InterContinental Hotel in Washington, DC for the 'Oscars of Infectious Diseases,' a festive evening celebrating distinguished leaders and public health heroes. Nominations for the 2019 Maxwell Finland Award for Scientific Achievement and Jimmy and Rosalynn Carter Humanitarian Award will be accepted online until June 30, 2018. Awards will be presented at a black-tie gala in the spring of 2019 in the Washington, DC area. 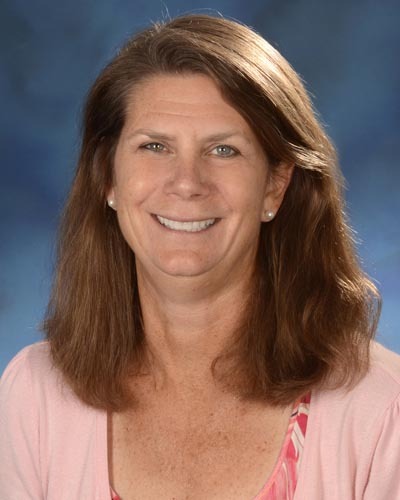 NFID congratulates Board member Kathleen M. Neuzil, MD, MPH, on being named one of Maryland’s Top 100 Women, a well-deserved honor! The award recognizes high-achieving Maryland women who are making an impact through their leadership, community service, and mentoring.